"Setting Lights" or the practice of using lamps seems all but lost. I know only a few practitioners that still use this means of offering. That is exactly why I am offering it here-because I have found that many clients are requesting this service and because I do not want it to be a lost and unavailable practice. You have to give to get. There are many universal laws out there that reinforce this belief in any religion. Most practitioners, when they execute a spell, just ask for something. I find this to be insulting to the deities and pretty damn superficial too. Setting Lights is another means to give praise. By setting lights we are saying, "here is the glory and honor to you, I leave this offering and light to remind me of your force in my life". I then go through a series of appropriate prayers for the situation. Never once do I ask for anything, I simply give an offering to strengthen the communication between the divine and ourselves and the rest happens on it's own because like begets like. 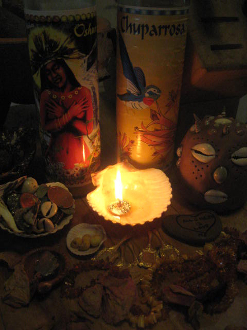 the prayers, offerings, and Orisha chosen are what tailor the lamp to you. As above, so below. The divine is within us-if we give for the sake of giving-the divine will give for the sake of giving as well. You will be contacted as for the best day to begin and a photograph of the lamp and offerings will be e-mailed to you along with what offerings were made. Your petition and prayers will be recited each day or night for the 5 days. *****I will need the date of birth, full names (maiden if applicable) and cities the involved persons reside in. No more than two people please. YOU MUST contact me using the CONTACT link on my home page and send me the information about you circumstance. feedback; "All of the care and thoughtfulness put into this working was felt by myself and my son. This working has been integral to his healing and I Have no doubt with your help all of our prayers will be answered. Many thanks and many blessings!" *The pictures above are pictures from actual lamp lightings I have performed on the behalf of clients. I hope to serve you soon. ashe'!